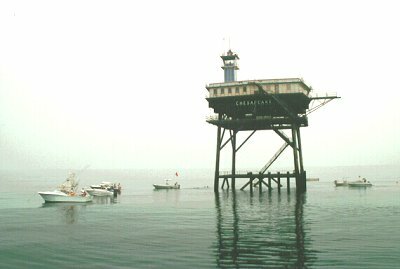 Chesapeake Light Tower – Chesapeake Chapter U.S.L.H.S. The Chesapeake Light Tower stands 13 miles offshore in the Atlantic Ocean off Virginia Beach. This steel, “Texas style” tower was built in 1965 and is 120 feet tall. The tower is supported by four 33 inch concrete filled steel pilings driven 180 feet into the ocean bottom. This so-called Texas tower was an adaptation modeled on the offshore oil drilling platforms first employed off the Texas coast.